Custom built, impressive single family home with income producing carriage house! The main house includes 3 bedrooms, 4 baths, solarium, large open kitchen with 2 sided breakfast bar, pantry, custom glass and solid wood cabinetry & brand new stainless appliances, fully finished basement with vaulted, bright guest suite, 9.5 ft ceilings, media room with home theater & wet bar with dual-tap kegerator! 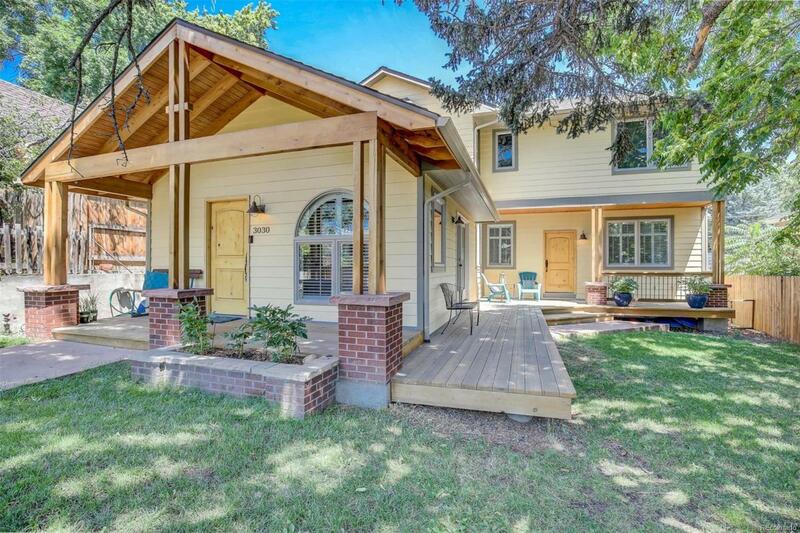 This unique home features inspired reclaimed wood architectural elements & built-ins* The 1 bed, 1 full bath 709 square foot carriage house features a kitchenette, laundry hook-ups, living & eating area. Perfect for legal Air BNB, long term rental, nanny, teen or mother in-law quarters! This highly efficient home boasts many "green features SOLAR, Eco-Foam Insulation R-Value 50, Tankless, SOLAR H2O Heater, Multi-Zoned Thermostats, central vac*A++ location just a few blocks to Sloans Lake, Slo-Hi Coffee & Bikes, Highland Square, Hogshead Brewery, shops on Tennyson St & Edison Elementary!